Care to give $1 to Unicef? Just keep talking. We've all said things we regret, sometimes several times in the same sentence, occasionally involving donkeys, marital congress, and the inauspiciousness of your opponent's birth sign. Or something along those lines, but Canadian Bakz Awan has a solution. Every time you mouth off - and yes, I mean you, the one at the back there with the T shirt you thought was funny but really isn't - put a buck in the swear jar. Your contribution goes straight to Unicef which, if this catches on, will have cash flowing out of its metaphorical ears in no time at all. The swear jar for gamers isn't quite ready yet; Awan has to work out some kinks. When complete, it will be an app that you download to the smartphone of your choice. You mouth off, click the app, fill the jar with loot, and send said loot off to Unicef. "It started out just as an inside joke with some friends of mine - I challenged them to try not to swear during their game play, it was damn ... erm ... darn near impossible for them to quit," says Awan. So the next logical step was to invent a swear jar for everyone to use. Awan doesn't think he's going to change the world, but if it does even a little good and raises some cash for charity, then it's done more than enough. It won't be long before the swear jar becomes a reality - Awan's hoping it'll be done within the next few days - so if you feel the need, better start swearing now before the jar shows up. 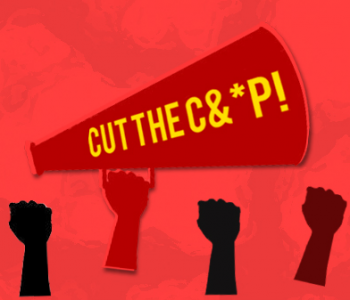 If you want to support Awan's noble cause, you could Tweet #CUTTHEC&*P, or even visit his website and take the pledge. You know you want to, you donkey-caressing son of a beetroot.